Seal empanadas, turnovers, and your favorite filled pastries with this convenient gadget. The secret to a perfect pocket has arrived. 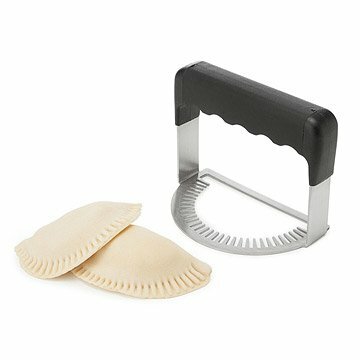 Whether you love empanadas, turnovers, or simply trying to fit your favorite fillings between two layers of dough, this handy kitchen tool seals the deal. Stainless steel prongs push down on your pastry to create a complete seal for seasoned veggies, sweetened fruits, and more. Made in China. Read about how Hipatia invented the Empanada Fork and took it all the way to being a product we sell at UncommonGoods, on our blog. I love anything that's useful and well-constructed for my kitchen and this fabulous pressing fork is all of that as well as an attractive addition to my specialty bakeware collection. Very small, Not sturdy, hard to seal the empanadas. This tool worked well and was impressively well-made. Quality construction and materials. Should last a lifetime. This makes more profesional-looking empanadas than any other gadget I know of, and I've made probably 1000 empanadas. And the dough doesn't stick to it like it does to other similar crimpers. I gave one to my grandson, and he raved about it so I bought one for myself! No more using a fork to close the yumminess up. This product has saved me time when making my Empanadas. I no longer have to use a fork now I have this GREAT fork who does the work for me. I also use it to mash soft veggies and fruits. I love that it's a tool I can use for several things. Love it, a great CREATIVE kitchen tool. What is great about this is you can make anything you want dessert type, meat or veggie and you can fry it or bake it and it is a great appetizer and always a big hit with parties. Easy and fast to make no mess when eating, does not require to eat with fork plate somewhat... a great finger food. No only fast but seals the food in great. So I say this emapanada fork is "FAST AND FURIOUS". Annie's got her (gun) empanada fork! If it worked it would have been great.